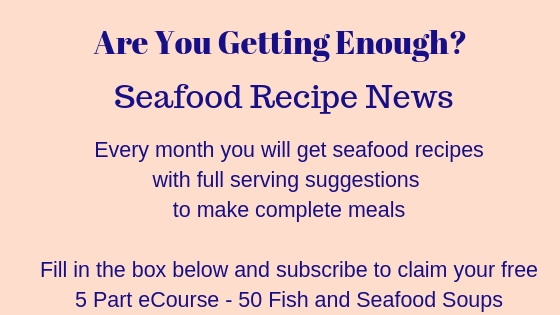 This is one of the easiest salmon salad recipes I have found. 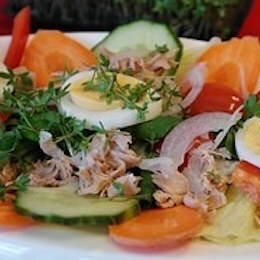 A simple salad with a dressing - serve with some hot new potatoes or crusty french bread to mop up the juices. 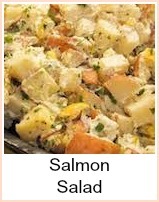 It couldn't be easier than this - if you don't want to cook salmon, then you could use a can of salmon instead. If you do that, then turn the can out onto a plate. Separate the skin, juice, bone and flesh. Put the oil, vinegar and sugar in a small jar with a lid - give it a good shake and leave it to one side. Put the lettuce in the bottom of a big serving dish. Add the rest of the salad ingredients and give them a good mix. Give the dressing another good shake and then pour over the salad. Flake the salmon over it. Quarter the eggs and arrange them around the dish. Chop the capers and scatter them over the salad. Allow people to help themselves from the salad bowl. Serve some buttered new potatoes or crusty bread and butter with the salad. 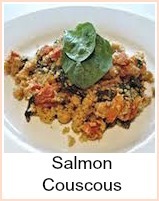 If you're using canned salmon, a question that often comes up is whether pink salmon is different to red salmon. The answer is 'yes' - they're a different species of fish. Red salmon is 'Sockeye' and pink salmon is commonly known as 'Humpie'. Red is larger than pink and generally has a stronger flavour. When it comes to buying them, red is more expensive than pink. If you're going to be using a strong dressing, say in sandwiches, then you can quite acceptably use the cheaper pink salmon - it's good for cooking in quiches and the like. I remember decades ago, a teacher of mine telling us that she'd catered for her own wedding (this was around 1970) and she'd used red food colouring for the pink salmon sandwiches! 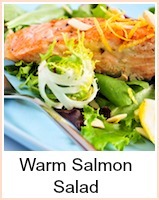 Succulent salmon with a lovely crisp salad is perfect any time.